Since everyone is talking about Rivals of Ixalan and Standard bans, I will stay the course and discuss Modern. You probably don’t want to read about any more Pirate and Merfolk brews or how Temur Energy actually hasn’t gone anywhere. I played Starcity Open: Columbus with Modern Burn to reasonable success a few weeks ago; 10-5 good for 39th place. Top 8 contention was lost after round fourteen so it was a deep run for me. It was my first big event with Burn so I have some changes to discuss as well as sideboard plans. Even though Burn is a well-defined archetype by now, I couldn’t find a lot of literature on the specifics. Today I will talk about my approach against the popular archetypes. Many people have asked me why I would play Burn given my deck history. I like to get value and Burn looks to throw cards at your opponent’s face. Why would I make such a drastic change? The answer is because the floor on the power level is high. I’m practicing for Pro Tour: Rivals of Ixalan where I’ll be squaring off against very talented opponents. It would be nice if my deck could deliver regardless of the skill level of my competition. Burn also punishes your opponent if they stumble at all and the worst matchups (Boggles, MartyrProc, and Ad Nauseam) are barely represented. I’m also going to be very tired as the Pro Tour schedule is grueling. Grindy decks take more brain power and I want to conserve my strength for Limited. I hope to do RIW Hobbies and Team First Strike proud and I think Burn will be my best option. There isn’t much to do with the maindeck and it’s pretty close to what I wrote about a couple weeks ago. I have a choice of a total of 42 spells and 18-20 lands. For each land beyond 18 I need to cut one of the 42 stock spells. In this list, I played 20 lands and shaved the second Grim Lavamancer and fourth Skullcrack. Nearly every Burn deck I saw is making this tradeoff between the 41st and 42nd spell for the last two lands. It’s also possible to trim down to three Searing Blaze in the main. Snow-Covered Mountain tricked a couple people over the course of the tournament and I passed my deck check so it was gravy. If my opponent believes I’m playing a different deck for even a single turn, it’s a win for me. I get a horrible feeling when I make plays in Modern based on the deck I think I’m facing only to discover it’s something else. Many plays that once made sense can put me behind. I would play a different set of fetch lands in the future. Scalding Tarn can trick the opponent into believing I’m running Jeskai. Wooded Foothills is a bigger giveaway Burn is my deck. Bloodstained Mire into Mountain or Sacred Foundry doesn’t have a tier 1 option so they will likely put me on Burn. It’s still important to play a split to get around Pithing Needle effects. 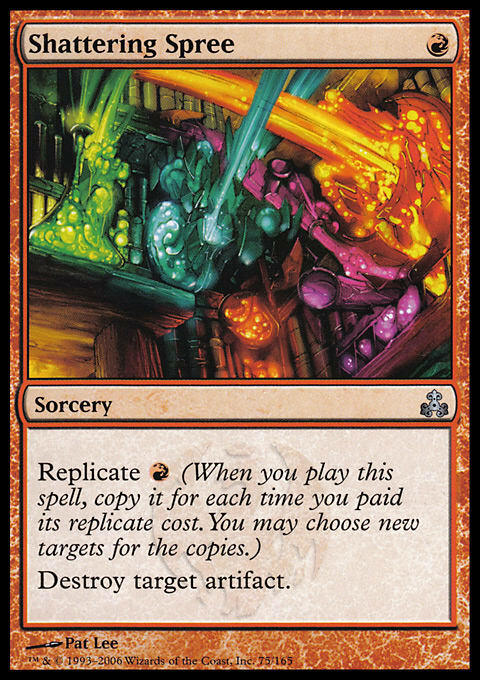 Shattering Spree is definitely the best artifact removal spell to play in the sideboard. I played against Eldrazi Tron twice and it was a boon not worrying what number they chose with Chalice of the Void. I was also supposed to be more aggressive destroying Expedition Map. Spree is the only card I want to draw if I faced Affinity or Lantern. Destructive Revelry would have been bad. I faced three unique enchantments in 15 rounds — Runed Halo, Eidolon of the Great Revel, and Spreading Seas. It’s awkward to board in Destructive Revelry against a deck that can easily mess with Stomping Ground. Runed Halo can be awkward when they name Eidolon of the Great Revel as it might be correct at some point to burn out your own creature to turn off the effect. Skullcrack can turn off this prevention shield for a turn. It’s not a scary enough card to board in Revelry even if I had it. If I faced decks like Ad Nauseam, Martyr Proc, or Boggles, a single Disenchant effect wouldn’t turn those horrible matchups into match wins. It’s right to not even try and beat them with targeted interaction and let the gods decide who wins. I’ve played about fifty matches with Burn and haven’t faced these three bad matchups yet. Leyline of Sanctity is very fringe right now. 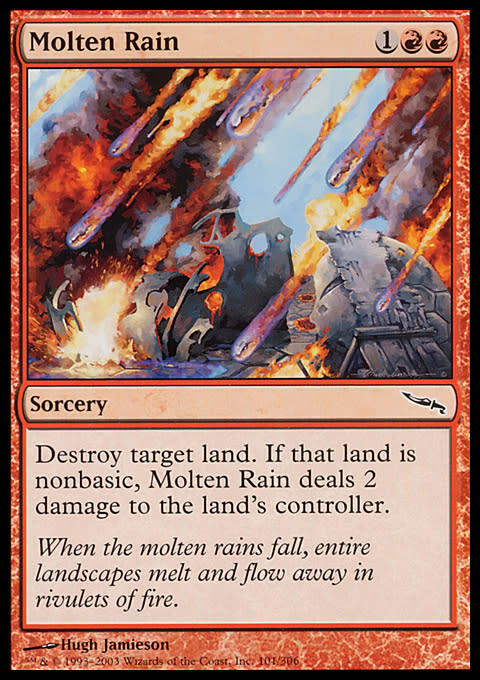 Molten Rain and Skullcrack came in versus Tron and other decks where Searing Blaze was bad. This happened often in my matches and Molten Rain exceeded my expectations. It was phenomenal against Breach since they needed to resolve a 5-drop. Control could be taken off Cryptic Command mana prematurely, too. Surprisingly it was weakest in my match against Tron, but it was still strong. There weren’t many matchups I faced where Searing Blood would have been awesome, but that sometimes happens in Modern. It was nice I could swap Searing Blaze for Searing Blood in the Burn mirror or play more than four of that effect. I will experiment with just three Searing Blood in the board. I didn’t miss Deflecting Palm, even though I faced the Burn mirror twice. It was cast against me, but I could play around it. Skullcrack turns off the prevention shield rendering the spell useless. Skullcrack also can’t be redirected by Deflecting Palm because the entire spell needs to resolve before it is prevented and sent back at my face. It plays out like a Lightning Helix that can go horribly wrong. It would have been bad against Eldrazi Tron, too. Chalice of the Void for two before attacks would be embarrassing. My hand was revealed multiple times to Thought-Knot Seer, so it could be navigated by experienced pilots. Kor Firewalker was also not missed. The Burn mirror was very strange because there were so many insane 2-drops. Whoever could dump their hand faster was at an advantage, which meant I liked 1-drops more than expected — even Rift Bolt. This meant I was cutting high-impact 2-drops for my minimal sideboarding. There’s no reason to use precious sideboard space to make a good card better against only the mirror which is about 5% of the field. Path to Exile was fine and I was happy with two. I faced three Death's Shadow decks and would have boarded in a third Path if I had it. A couple to stop Wurmcoil Engine against Tron was nice, too. 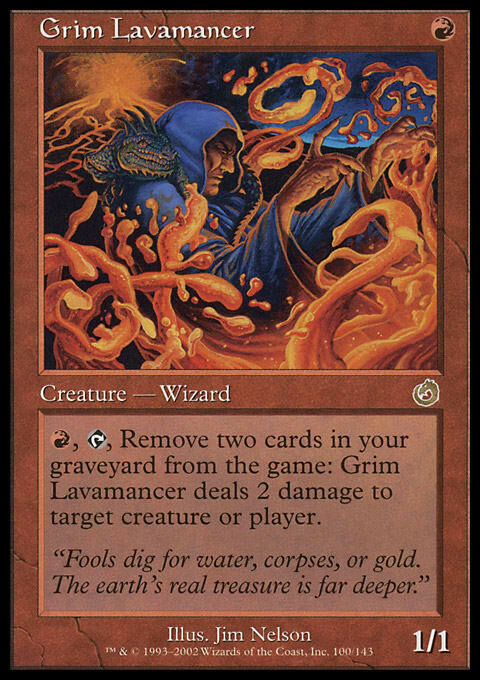 Grim Lavamancer exceeded my expectations. Not only is it great against creature decks, but it provided a repeatable source of damage. It feels like a mistake to not play two in the maindeck given the strength of 1-drops. Twenty lands was bad for me. I mulliganed to five many times and even four. A good amount of those seven card hands had four lands. I would also advise shipping most seven card hands with a single land, and that’s where we’re making the trade off by going to nineteen lands. If you have four castable spells with the single Red source I would keep. Some decks vomit their hand on the battlefield early like Affinity, which means you need to be quicker to the board. Control decks take a while to win which makes spell-heavy hands more powerful. Most of the games I lost were keeping one-land hands with only three 1-drops. It would take me awhile to find the second land and I couldn’t recover. Grim Lavamancer lets me keep more hands. When your opening hand has three lands and no creatures, all the hand does is about twelve damage. That’s not very exciting and can leave you at the mercy of topdecks. That’s not where I want to be. More early creatures make my later topdecks worse, but the early to mid game stronger. Since I took a Grim Lavamancer from the sideboard and cut a land to make room I had one free slot. 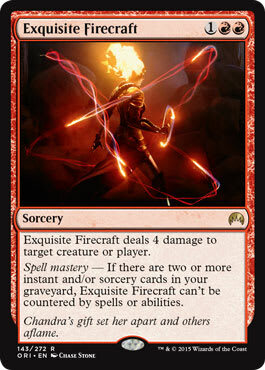 Exquisite Firecraft in the sideboard would have been great for me. It’s another spell to add when Searing Blaze is no good. It’s another way to kill Death's Shadow without play three Paths. Keep in mind Grim Lavamancer wants to exile lands and creatures before spells to keep spell mastery active. Notice these are all 1-drops. It is reasonable to cut Grim Lavamancer or Rift Bolt, but not too many. The more I play the deck, it feels like cutting Rift Bolt is a mistake. 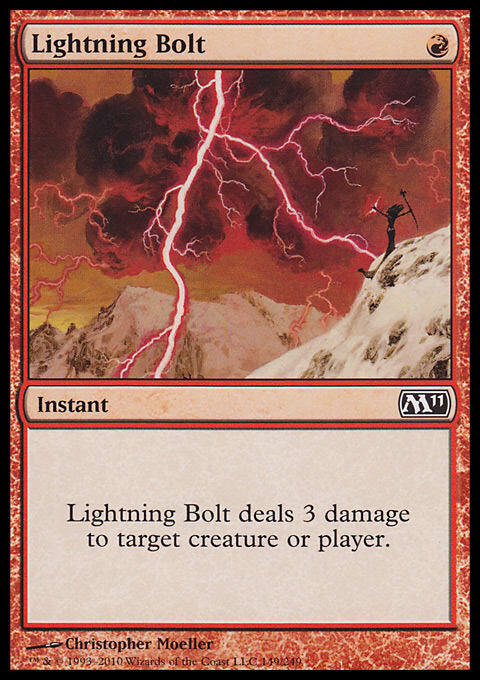 It’s basically Lightning Bolt, but suspend can be awkward against Meddling Mage, Runed Halo, and Wasteland Strangler. Grim Lavamancer gets weaker if you want Rest in Peace. I don’t care if Lava Spike can’t hit creatures, you need to go to the dome eventually. Don’t board them out. Game 1, Skullcrack is strong because it stops Vault Skirge from gaining life. After board there are seven additional answers to Vault Skirge so I don’t fear it as much. I can attack into Etched Champion if I draw Skullcrack to ignore damage prevention so it still has value. Etched Champion is the most annoying card by far. Shattering Spree destroys primary threats as well as random artifacts laying around. This is important because those are turned into damage thanks to Arcbound Ravager and Cranial Plating. Spree is your best card post board. Eidolon of the Great Revel isn’t amazing, but it’s a source of continuous damage. If the game goes long Affinity will prevail so you can’t be a pure control deck. 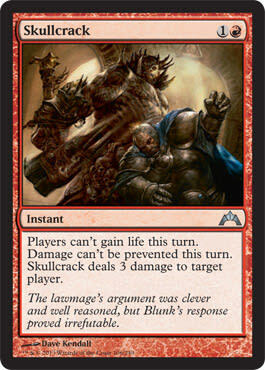 Boros Charm is the worst of the 2-mana burn spells. It doesn’t affect the board, gain life, or prevent life gain. I may have to take damage to find the White source to cast it on time which also isn’t acceptable. Arcbound Ravager needs to die early because creatures can be sacrificed to fizzle Lightning Helix and Searing Blood. They may go all-in on a creature in response to a three damage effect. Path to Exile was marginal for me because they have so many bad creatures I have to kill. It’s not worth trying to weed whack all of the Ornithopters and Nexi. Use Shattering Spree to clean up the mess and try to deal damage as quickly as possible. Be aware of Spell Pierce after board. Affinity knows your best answers have “Searing” in the name. This matchup can be improved with practice. Identify what is important. Overall it feels like a slightly weak matchup that is winnable. Path to Exile can be boarded in to fight Kor Firewalker, but it’s the only appealing target. Searing cards can take out opposing creatures already. Watch how they fetch for lands for Kor Firewalker clues. If they do something unnatural like get aggressive with fetching Sacred Foundry I might put them on Kor Firewalker for Game 3 and board in Paths. Searing Blood kills everything except Monastery Swiftspear with prowess. If you play around prowess, Searing Blood is the stronger spell as it doesn’t require landfall to get the full effect. Make sure to fire off your Lightning Helix when they are tapped out, as it plays around Skullcrack and Deflecting Palm. I want to keep my life total high, so fetching White mana isn’t my top priority. This means casting Lightning Helix and Boros Charm early so I don’t need a second White source. Inspiring Vantage is the best land in the matchup as it is painless White mana. Thragtusk and Collective Brutality are their best cards against you. If they are playing Mono-Green then Thought-Knot Seer will replace their Collective Brutality in the sideboard. Either way, be ready to Skullcrack their Thragtusk life gain. It’s also very likely a couple Nature's Claim are brought in to destroy their own artifacts and gain four life. Eidolon of the Great Revel gets better after sideboard because they are cutting expensive monsters for lower to the ground interaction. Path to Exile is in on the draw because they can Wurmcoil Engine you before Molten Rain comes online. This is a strong matchup even with Collective Brutality, but Tron can always punish you with a strong draw. Game 1, I want to resolve my Lava Spikes first as they can’t be fired off at the end of my opponent’s turn. Lightning Bolt can hit Spell Queller which is an important interaction; ? blockers are annoying. Spell Snare is their only tricky counter Game 1. 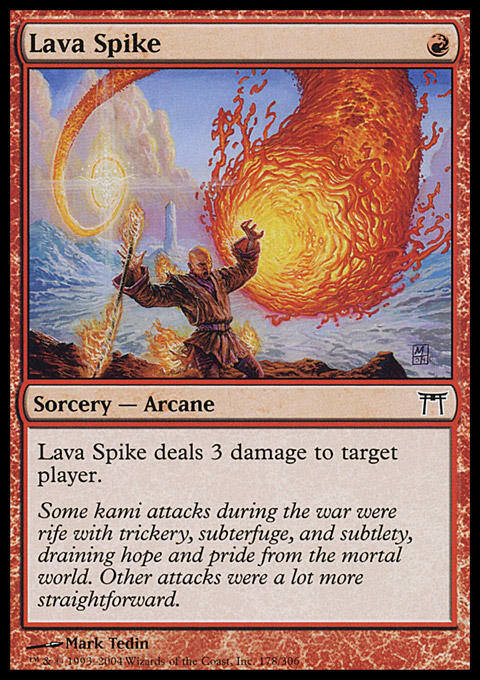 Dispel complicates things after sideboard and Lava Spike becomes a better spell to resolve to close the game. Searing Blaze is difficult to resolve because their deck is full of counters and you have only eight targets- four Snapcaster Mage and four Spell Queller. Cryptic Command is a great counter if it resolves, but you can use the high mana cost to your advantage. Keep the board clear because draw-go can favor you in the late game. This is a better strategy in the first game because they have clunkier counters. There will be a point where they fire off Lightning Helix and you respond with Skullcrack. 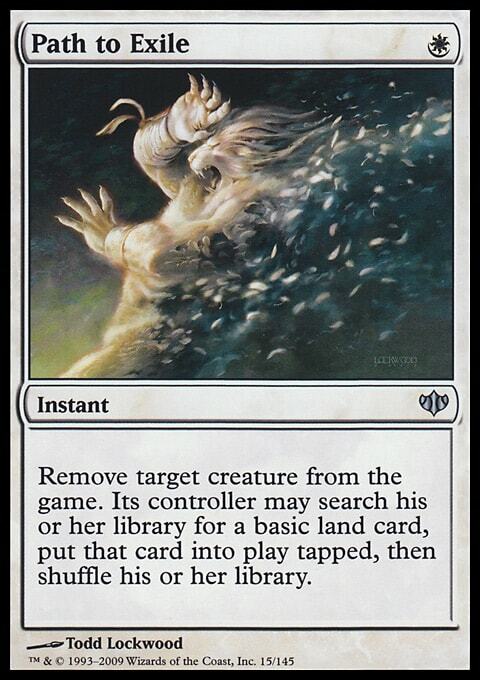 Make sure to first cast a bait spell like Boros Charm to draw out Dispel or Spell Snare. Rift Bolt can be used to cast a flurry of spells on the same turn. Sometimes I hold on to Rift Bolt only to suspend a turn before I commit to dumping my hand. This is more common in Game 1 before the efficient counters come in. Overall, I think this is a good matchup, but Jeskai has the tools to improve if they want to dedicate sideboard space. The most awkward part of this matchup is managing your opponent’s life total. If they dip below 13 life and don’t cast a Death's Shadow it’s likely they don’t have one. These games are easier as their other threats like Tarmogoyf, Tasigur, the Golden Fang, and Gurmag Angler win slower. If they resolve an early Death's Shadow, you need to pump the breaks on throwing burn at their face. I like to hold two spells to cast at the end of their turn and untap to resolve the last few points before a massive Death's Shadow hits. The sideboarding is fairly straightforward. Searing Blaze is bad because it doesn’t kill any of their impactful creatures. Even if you hit a Death's Shadow their life total will decrease before it dies. Exquisite Firecraft can kill Death's Shadow the turn it enters the battlefield if they are above eight life. Keep in mind they board out as many Street Wraiths as possible so it’s likely they have zero or one in their deck post board. 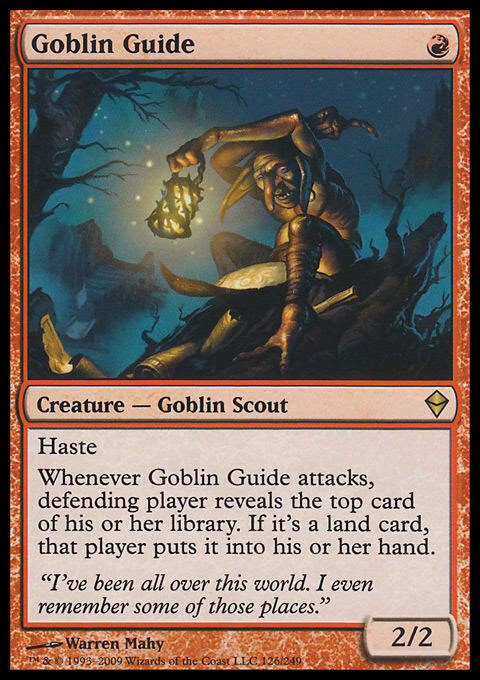 Rest in Peace is good if they draw Gurmag Angler, Tasigur, or Tarmogoyf, but not if they draw Death's Shadow to win. It’s a risky card so I don’t want to draw doubles. It makes Grim Lavamancer weaker, but I still want 1/1s to block Death's Shadow. This is because when I don’t draw a lot of lands it can be difficult to double-spell before Death's Shadow kills me. Collective Brutality is their best card against you, but they don’t typically play more than two. This means I don’t want to hold up Skullcrack at an unnatural time to play around preventing two life from being gained. Overall I think this is a good matchup if you play tight, but the skill level of your opponent is also important. That’s all I have for this week. Post in the comments if you are curious on how I approach other matchups.